A collection of Paterson nonprofit groups received $25,000 in donations from the M&T Bank and an anonymous donor. M&T Bank donated $12,500 to Give2Paterson, a campaign created and run by ten of the city’s top nonprofit organizations to gather financial support for initiatives that aim to improve people’s lives, after an anonymous donor offered to match contributions made by the bank to the campaign. The anonymous donor matched the bank’s contribution by giving $12,500. The $25,000 will fund initiatives run eight organizations: CUMAC, New Jersey Community Development Corporation (NJCDC), Habitat for Humanity of Paterson, Oasis–A Haven for Women and Children, Eva’s Village, St. Paul’s Community Development Corporation, Boys & Girls Club of Paterson & Passaic, and the YMCA of Paterson. 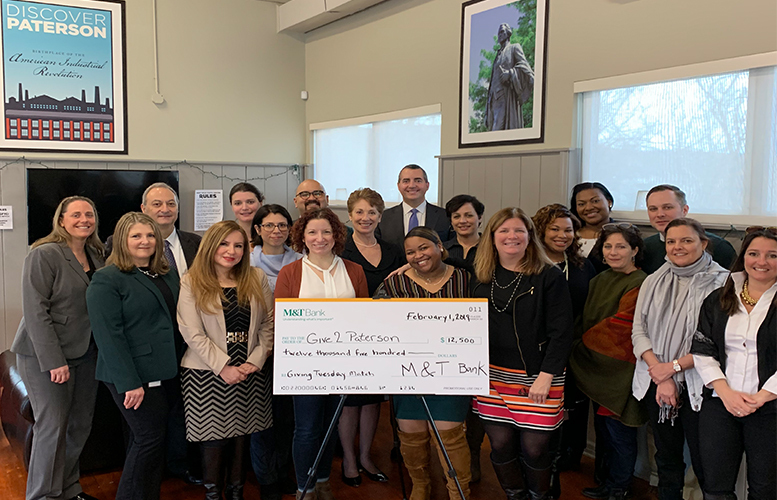 M&T Bank presented its check to the groups on February 1. The Give2Paterson campaign was started four years ago by a collection of Paterson-based charities. It holds an annual fundraising initiative ahead of Giving Tuesday. In 2018, the campaign raised $95,000 or 650-percent more than what it raised in 2017. For more information or to Give2Paterson visit http://www.give2paterson.org.